We wrote Santa to ask him which beers he drinks over Christmas, but we never heard back. So instead we found five beers from across the country that we think you (and St. Nick) would enjoy over the holiday. The can looks like a candy cane, and the "holiday spices" inside taste like watching a movie with a stop-motion Rudolph in it. This is Christmas in a can, plain and simple. You could drink this in July and it might fool you into thinking it's snowing outside. Check the rundown of some of the spices in this sucker: ground cinnamon, chicory, ginger, and allspice. That's quite Christmassy. And the beer even has a cool backstory -- it was developed by a tiny subset of Terrapin employees as part of a yearly homebrew challenge. Look at that cute little guy on the label! Nothing says Christmas like a beer that packs in some festive cherry notes. As a bonus, it has an ABV that will ensure you forget everything about the holiday other than the beer you were drinking. A decidedly more metal option than any other Christmas beer on the shelves this season, this tasty malt-bomb has notes of chocolate, and apparently pairs well with balls. St. Nick might deliver you an iPhone 6, but Saint Arnold will deliver five malts and a "spicy hop character", which is way more valuable. Fine, you can probably get more on eBay for the phone. 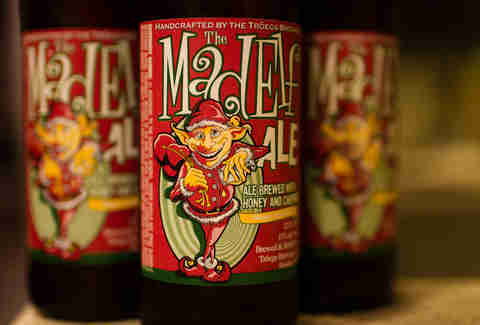 Regardless, this seasonal's been pleasing beer drinkers for nearly 20 years for a reason. It tastes just like Christmas. 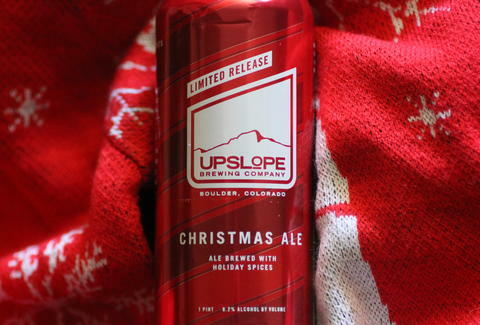 Lee Breslouer writes about food and drink for Thrillist, and is sad that he only has one can of Upslope's Christmas Ale left. Follow him to holiday cheer at @LeeBreslouer.